The idea was to attempt a through trip from the resurgence to top entrance. This can only be done in drought conditions so we hoped that after many weeks of very dry weather it would be possible. We rigged top entrance for our exit and then walked down the valley and entered the system at the lower entrance. None of the cave is easy going. Most of the passage is flat out crawling and everything is covered in a thick layer of sticky dark brown mud. The cave feels gloomy and uninviting. After about half an hour we were forced to turn back where the way on was flooded and would have required helmets to be removed and noses to be pressed to the roof. We then went back and dropped into top entrance to explored the nicely decorated Waiting Room and Lathkiller Hall. We found it this time after a 2 mile trek over the Black Mountains due to the advent of GPS technology! 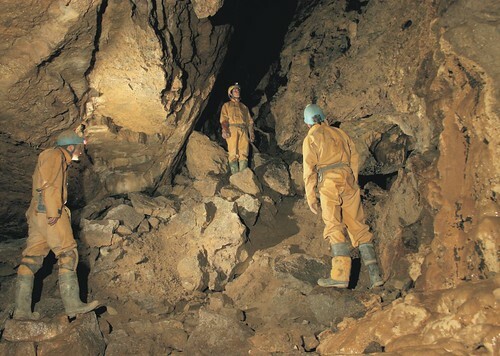 It's not the easiest cave to find and almost impossible if you only have the instructions in the guide book to follow. Also the description in the guide book appears to be incomplete. We explored most of the 'old series' and dropped the second pitch to explore some of the new. Lots of places in the cave to still explore next time. In the chamber below the entrance pitches. Keith Edwards in the chamber below the entrance pitches. 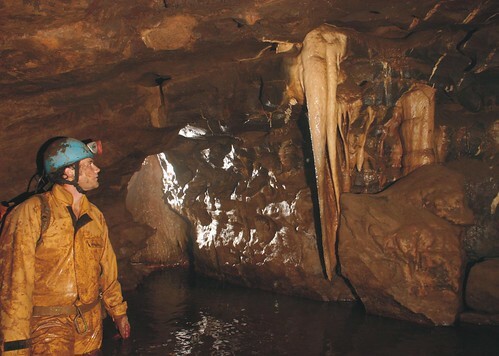 The clue was in the name "Small Cave", but with 1km of passage, it was one to be ticked off. Picking one of the hottest days of the year and praying to avoid thunderstorms we set off to explore this 'sporting streamway' The cave is formed in gently dipping bedding planes often following bands of washed out shale. The cave is very flood prone with much debris in the entrance passages and further into the cave the walls and roof covered with silt. The route follows the stream, but you often have to climb up over collapses. A long silted up flat out canal brings you to sump one, where a sporting duck with a rope handline leads you to the sump bypass. A exhibition in comedy climbing techniques followed as we tackled the 15 foot tight chimney up into the rift passage that bypasses the sump. A large oppressive passage is gained before it reduces in size and sump 2 is gained. 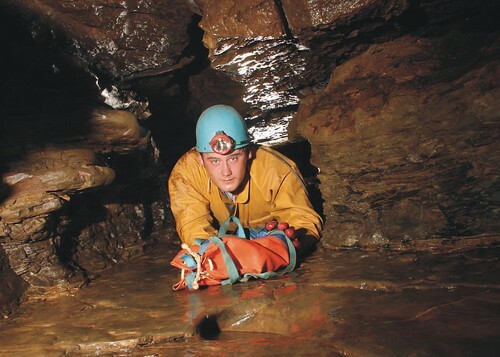 Mark Rollinson in a crawl in Ogof Fechan. 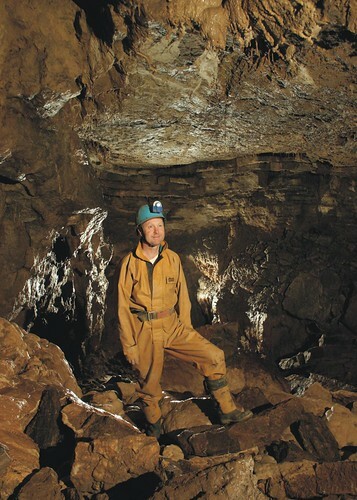 Mark Rollinson in the Ogof Fechan streamway.